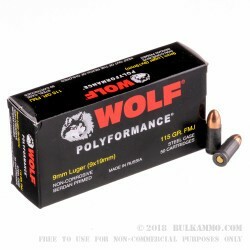 Wolf ammunition is an excellent alternative for those who want to drive the cost of 9mm Luger ammo down at the range. 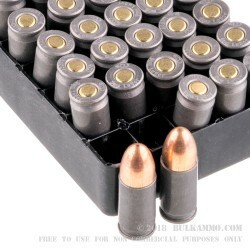 Each cartridge in this box of 50 fires a 115 grain bimetal jacketed bullet that delivers good accuracy. These cartridges use non-corrosive Berdan primers and polymer coated steel cases that, while not reloadable, provide reliable cycling and contribute significantly to the lower cost of this ammo. Note that due to its steel components, this ammo has some magnetic properties and may not be suitable for all indoor ranges. 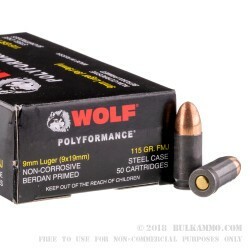 Wolf ammo is made in Russia, where steel-cased ammunition is very popular due to the low cost of iron ore in that country. good ammo, shot 400 rounds no FTF...good value.